Two Great Workshops… One Low Price! 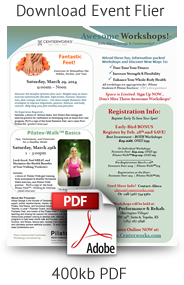 Join Aliesa George on Saturday, March 29, 2014 in Topeka, KS for fun, information-packed workshops and discover new ways to fine‐tune your fitness, increase strength and flexibility, and enhance your whole‐body health. All workshops are appropriate for: Pilates Students & Pilates Teachers (CEC’s thru petition). Space is limited. Register for both workshops by February 28th for only $159. Discover the benefits of better foot care! Helpful easy‐to‐learn exercise solutions for flat feet, high arches, bunions, hammertoes, foot cramps, and more… Use these simple Fantastic Feet strategies to improve alignment, posture, balance, and body control. Help keep your feet healthy and pain‐free. Look good, feel great, and maximize the health benefits of your walking workouts! Can’t attend the workshops? Sign up for an upcoming virtual Fantastic Feet workshop or, contact Aliesa George online or call (316) 734‐5360 to host a live workshop event in your city.